Barking is a very natural, instinctual reaction to something in a dog’s environment, deeply ingrained over tens of thousands of years from early wolves. In this case, your dog’s barking is probably a means of alerting you, the owner and head of the ‘family’ to a potential threat or intruder. He might also be barking as a way of letting the ‘outsider’ know this is his territory, and to back off. If this is the case, the barking dog will stop barking once he doesn’t feel he needs to warn of threats, and you have everything under control. Training a dog to stop barking in these cases requires slow and careful behavioral adjustment over time, requiring the owner to act calm and composed at all times. Certain breeds, like many herding dog breeds, were selectively bred for barking behavior, and will naturally bark more often than others. It may be all but impossible to stop this natural behavior without an anti-bark collar.. Dogs almost always either bark to get your (someone’s, another dogs, etc.) attention, or because their attention is focused on something else. ‘Redirection’ is a very popular training technique today! When your dog is barking, simply try to redirect his attention toward you by becoming the most interesting thing in the room, or stepping between your dog’s field of vision and the distraction he’s focused on. Never yell or become emotional in an attempt to correct your dog for barking. This is an Extremely common mistake! When an owner responds emotionally to a dog’s barking, it tells the dog there is something wrong with the situation, confirming his suspicions, enhancing his anxiety, and causing him to bark more. 1. Why do Dogs Bark? Aversive Dog Training: An aversive is another word for any unpleasant or undesirable stimulus used to correct dog behavior. Though they can be, aversives aren’t necessarily painful in the least! An aversive could be as small as a slight buzz or beeping noise, just enough to get the dog’s attention. The term ‘positive reinforcement’ is often misunderstood when people are talking about dog training. It’s almost always assumed that the term ‘positive’ means something good that the dog will like, but that isn’t correct. Positive Reinforcement: Something is being added to reinforce a dog’s behavior, be it pleasant or uncomfortable. A bark collar is a form of positive reinforcement. Negative Reinforcement: The term ‘negative’ simply means something is being taken away. Normally, bark collars either rely on the vibration caused by your dog when barking, or use a noise detecting microphone. Once the bark is detected, the collar releases some type of aversive stimulus, whether it be a simple vibration, electric jolt, surprising noise, or something else undesirable in order to alert the dog and stop dog barking. The psychology is simple. In time, your dog will form the association between the bark collar aversive and his bark, understanding a ‘zap’ (aversive) will immediately follow any bark he makes. He’ll soon begin to believe his own barking is causing discomfort. As long as the dog’s disdain for or discomfort caused by the aversive outweighs his desire to bark, he will eventually stop barking. Levels and Forms of Correction: The first electronic dog no bark collars only offered one or a few correction levels, but now the best dog bark collars come with many. One collar listed here offers as many as sixteen different strengths, on top of noise correction and a vibration setting! Be sure to invest in something that offers the right correction for your dog’s age and size, and leaves room for increases or decreases in strength if needed. Price: If you’re looking for a good collar these days, you’re probably going to spend money no matter who you go with. Still, price is one of the absolute biggest deciding factors dog owners use to make these decisions. It is also misleading; spending a few less for an inferior product isn’t worth it. Waterproof: If you’re looking, you’ll have a hard time finding a collar today that isn’t waterproof. After all, many breeds love to swim, roll around in puddles, mud, etc. Countless chances exist for your collar to get wet, so why not invest in something that will endure this treatment? Remote Range: If your dog never leaves your house or fenced in yard (assuming it is a small fenced in yard), you won’t need a long range. If you ever let your dog run in an open area, or want to take him to a dog park on the other hand, it just won’t due to have something that fails after a few hundred feet. Thankfully, most of the electronic dog collars listed here stretch between 5-600 yards (5-6 football fields)! Warranty: What will you do if your electronic dog collar breaks or becomes damaged? No handler wants to be out all that money because they didn’t warranty their collar. Make sure the dog bark collar you want offers a strong damage guarantee or warranty! 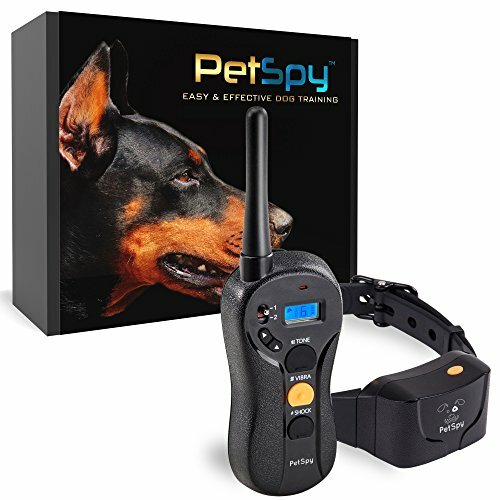 Advertised for dogs weighing anywhere from 10 to 120 pounds, the PetSpy rechargeable waterproof dog bark collar comes with a ‘convert your dog’s behavior within days’ money back guarantee! A whopping sixteen adjustable levels allow you to choose the perfect setting for your dog’s size and weight, easily avoiding too much or too little. A simple ‘blind operation’ design with touch distinguishing buttons allows for use so easy anyone could figure it out in no time. On top of all this, you get a lifetime replacement warranty, 24/7 customer support, and a free dog training guide! ➢ Free E-book with order + helpful training and operational videos! SportDOG FieldTrainer SD-425 Training e-Collar - DryTek Waterproof Receiver - 7 Adjustable Levels of Correction. - 500 Yards Remote Trainer. The waterproof SportDOG FieldTrainer is advertised for use with dogs 8 pounds and up, fitting necks 5-22 inches. Owners are offered seven different selectable stimulation levels complete with low and medium ranges, as well as tone and vibration options. Battery life offers a whopping 40-80 hours, along with a low battery indicator and two hour quick recharge! ➢ Waterproof, submersible up to 25 feet! Coming with a 1 year standard and up to 3 year warranty, the Petrainer is not just a simple bark collar, but an electronic correction collar very effective at correcting unwanted behaviors or setting boundaries for your fur kid! 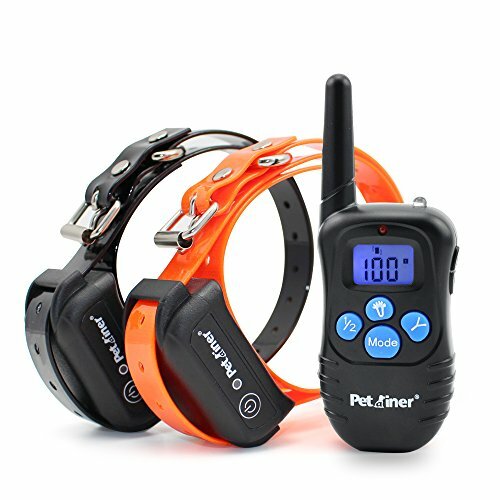 An unbelievable 100 levels of correction offers the right setting for any dog owner and absolutely any breed, on top of an audible warning and vibration so your dog has a chance to stop himself. Adjustable for neck sizes up to 25 inches, even the largest breed is covered. ➢ 100% waterproof, easy phone support! Advertised as completely pain free, this humane bark collar focuses on pure audible/sonic correction. Seven adjustable sensitivity levels make this sonic bark collar ideal for any noisy environment. A strong, durable nylon strap easily adjusts to dogs weighing between 11 to 110 pounds, and it is 100% water resistant! Complete with this collar, you’ll get two batteries, two covers, and a free training e-book! To top the list, you’ll get a 100% satisfaction and one year guarantee to boot. ➢ 100% waterproof, free E-book! Offering a unique new ‘intelligent’ bark vibration chip that prevents false readings, this stylish no bark collar is advertised for all dogs between 7 and 120 pounds. Seven adjustable sensitivity levels with three training modes ensure you’ll be given the appropriate correction for your little one. Charging is unique this time, allowing a usb interface with your phone, pc or laptop. 1. How do You Train a Dog Not to Bark? There are several different ways, or approaches, to train a dog not to bark, but the dog bark collar uses a much faster punishment/aversive type of training, compared to the slower reward based training. When the dog barks, his anti-bark collar simply emits a pre-programed stimulus. The dog begins to associate the discomfort with his barking, and simply stops barking in order to avoid any uncomfortable or startling effect. 2. How do Bark Collars Work? Bark collars are very simple! When a dog barks, his bark collar will emit some type of unpleasant aversive (buzz, electric shock, bell, etc.) in response. The dog begins to believe his barking is causing him discomfort, so he simply stops barking. 3. How do You Stop a Puppy from Barking? This completely depends on the age and size/weight of the puppy, considering most breeds are thought to be puppies until the two year mark. Even though bark collars are harmless and don’t cause actual pain, they shouldn’t be used to stop a young puppy barking, and certainly not puppies under two months old. Because these young dogs are still developing social skills and adjusting to their environment, the aversive correction from a bark collar could cause a sense of fear. Because their mental development has matured, and they are better adjusted to their living environments, bark collars can be used with older puppies without worry. Beyond the bark collar, socialization is vital to a puppy’s development. The more comfortable a puppy is with the other animals or people he encounters, the less anxious he is likely to be! 4. Are Bark Collars Humane? Bark collars, or any electronic dog collar, comes with a strong stigma. Electric collars provide a painless jolt, not a ‘shock’ like so many believe, just strong enough to startle the dog and redirect his attention. Any good e-collar today offers multiple adjustment levels in order to give the right stimulation for any size dog, without becoming too strong. On top of this, most collars give the option of a completely painless vibration or a simple tone. Owners don’t have to rely on actual physical discomfort if they don’t want. Electronic collars are a simple and extremely useful training tool, nothing more. 5. Are Bark Collars Safe? Bark collars don’t actually shock your dog at all, and are completely safe. 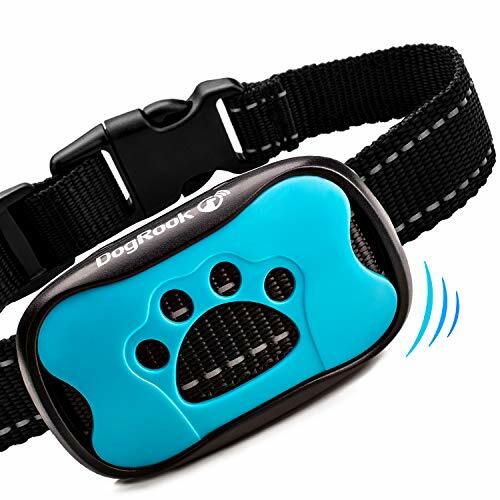 In fact, if used to teach boundaries, training dogs to avoid lethal dangers like busy roads or dangerous animals, these electronic collars are some of the best things for safety. 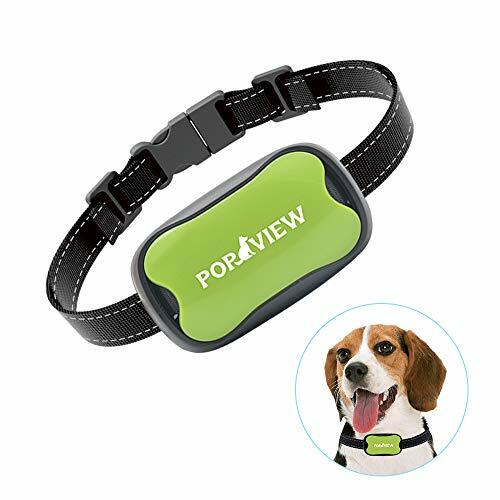 With today’s advanced bark collar or electric collar options, you’ll have absolutely no problem finding the best dog barking collars for small dogs, large barking dogs, dog barking in crate, or any other situation!